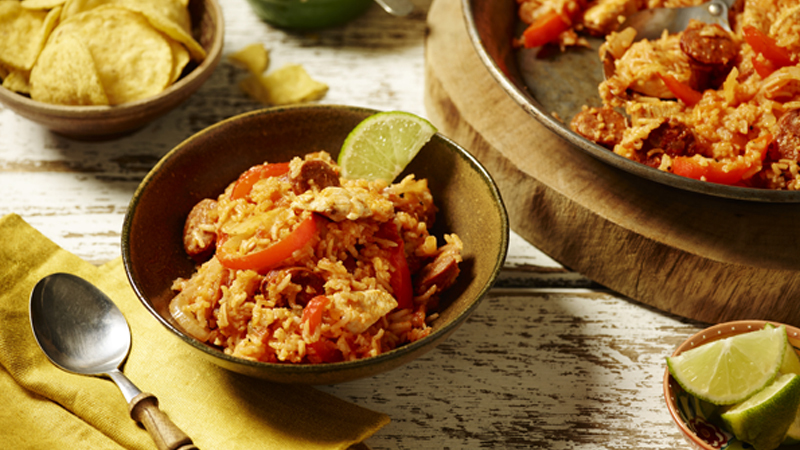 Old El Paso™ Salsa provides a simple addition to this chorizo and chicken jambalaya - a hearty dinner ready in 1 hour. 1. Heat the oil in a large non-stick pan and cook the onion and pepper, over a medium/high heat, for 5 minutes, then add the chorizo and chicken pieces and cook for a further 5 to 10 minutes until cooked through and golden. Stir in the Cajun seasoning for the last 2 minutes. 2. Pour in the salsa, rice and water and stir to combine. Bring to a boil, then turn down to a simmer, cover and cook, stirring occasionally, for 15-20 minutes, until the liquid is absorbed and the rice is cooked through. Season and serve with lime wedges. Stir through a pack of baby spinach leaves at the end for a quick vegetable addition. For an added kick, why not add in some chopped fresh red chilli. Stir in for the last 2 minutes of cooking the chorizo and chicken. Serve with Old El Paso™ Original Nachips™ and salsa.